I’m not someone who has chased high end brands, I never felt the allure of Prada sunglasses, Luis Vuitton luggage, or Gucci purses. But I’ve been asked to buy varying quality knock-offs more times than I can count. Well if you’re wondering why I don’t want to spend $1,000’s for a roll-on bag when a great quality Briggs & Riley can be had for only a few hundred we’re going to need a bigger blog. Maybe something stronger than this cappuccino I’m currently sipping. And a virtual trip back to my small town Midwestern roots. If you’re wondering how it came to pass that I’ve seen so many fake bags, belts, and other accessories that’s easy. I lived and worked in Asia for nearly four years. Try as I might to blend in (I learned to speak decent Tagalog plus a smattering of phrases for each country I visited), the locals saw me coming a mile away. If I was in a shopping area, even one geared towards locals, the patter would begin. Genuine Gucci. Real Rolex. Great price for you. Not being interested I would shake my head, perhaps even say no thank you. Of course they thought I was bargaining, so prices would drop precipitously. Then they would determine I must be a discerning foreigner. It was time to bring out the big guns – namely LV. Often this was done surreptitiously given the occasional crackdowns on these knock-off products. Are You Suffering From Designer Knock-Off Syndrome? This insidious disease is easy to catch, yet hard to detect until major damage is done. Have you said I’m not sure what to charge, so I’ll just peg it in the middle of my competition? Have you created products or services because it’s what your peers offer? Have you lowered your price because you were the highest, even if you offered superior services? Have you set a price to be the lowest on the market, regardless of the profit margin? If you answered yes to any of these questions then you are suffering from Designer Knock-Off Syndrome. 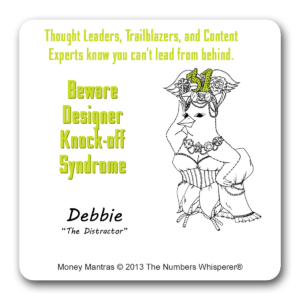 Thought Leaders, Trailblazers, and Content Experts know you can’t lead from behind. Strolling past those countless knock-off vendors I was looking for something unique, interesting, or compelling. While wandering around in Jaipur India I stumbled across an area where people were making bangles on the spot. Fascinated by the process I watched and then purchased a large number. While in Chaing Mai, Thailand I took pleasure in selecting a gorgeous hand carved Jade ring set in white gold. I have more stories like this than time or space to share. I had the means to purchase those knock-offs, but wasn’t interested. Even if they had been the real deal (heh heh… sure), I wouldn’t have been interested. It wasn’t the price. It was the story. It was the uniqueness of what they were offering. It was the craftmanship of the work being done. That was why I spent my money. Time to focus on understanding, evaluating, and embracing the unique value you and your business offer. Unless you want to become just another designer knock-off, me too business you need to focus on understanding, evaluating, and embracing the unique value you offer. It’s not easy changing your mindset. That’s why I’ve created Daily Money Mindset Boosters. Give it a try free. No cost, no obligation. Just a week dedicated to nurturing your prosperity mindset. Prosperity begins within. Knowledge is great, but action delivers results. You must want to follow through on what you learn. You must believe in your core this is the right path. #MondayMoneyMantra will help you establish and nurture a prosperity mindset. Want more? Click here to get a daily booster delivered straight to your phone.